The electromagnetic spectrum. Credit: CSIRO Australia. Radio waves are electromagnetic radiation of wavelengths longer than about 1 millimeter (corresponding to a frequency of 30 GHz). 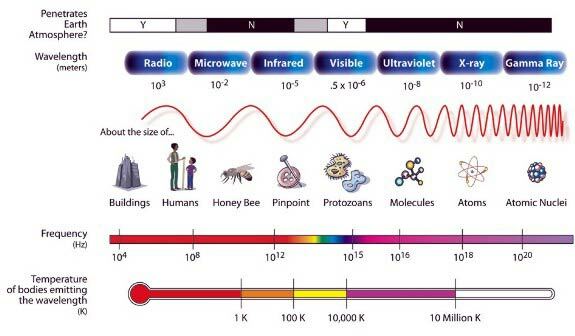 The shortest radio waves, from about 1 millimeter to 30 centimeters, are known as microwaves; the longest detected are about 30 meters long (10 MHz) but, in theory, could have a wavelength of 1 kilometer or more.